Saturday night prospect hockey was highlighted by the efforts of 2 New York Ranger prospects who haven't had the best of seasons so far this season. It was a very busy evening with some strong efforts, a huge battle in the OHL and a thrilling comeback in Prince George. It has been a rough season for the Ranger's 2011 3rd round pick as Steven Fogarty struggled through a hip injury that kept him out of the lineup during the first half of the season. 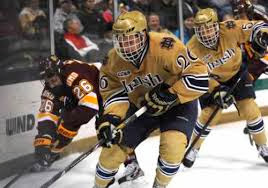 Even in the lineup, Fogarty just could not find the net going 1-3-4 until his 15th ranked Notre Dame hosted Lake Superior State on Saturday night. Fogarty had a 2 goal effort in the 2nd period that helped to earn him "first star of the game honors" as Notre Dame defeated Lake Superior State 4-2 to earn a weekend sweep and extend Notre Dame's winning streak to 4 games. With Notre Dame trailing 1-0, Fogarty scored both his goals during a 36 second span in the 2nd period that turned the game around in Notre Dame's favor. For Fogarty the twin goals were his 2nd and 3rd of the season and here are the highlights with a little Fogarty interview as well. While the goals were great, what stood out more was Fogarty looking for his offense as Fogarty took a game high 7 shots. The sophomore from Edina Minnesota is a player who has been followed here for the last 3 seasons and why he stopped taking shots has boggled the mind. Fogarty is a strong 6'3 who's future isn't at center but rather as a winger and the first thing I would tell him is to use his size and park his backside in the slot. Fogarty should have more than 3 goals at this point of the season and hopefully his play tonight will be the wakeup call he has needed. Mackenzie Skapski (NYR 2013 6th) is another prospect who was hurt by injury but also inconsistent play as well during the first half. Skapski one night would blow the lights out of a place with a great effort but he just was not stringing those efforts together until this past week. Skapski stopped 34 out of 36 shots to help his Kootenay Ice win their 3rd straight game 5-2 over the Swift Current Broncos. It was Skapski's 3rd straight win in goal something he had not done all season. Against a tough Swift Current team that has been at the top of the WHL Eastern conference standings all season, Skapski with the exception of a 2 goal 2nd period kept Swift Current off balanced and off the scoreboard. 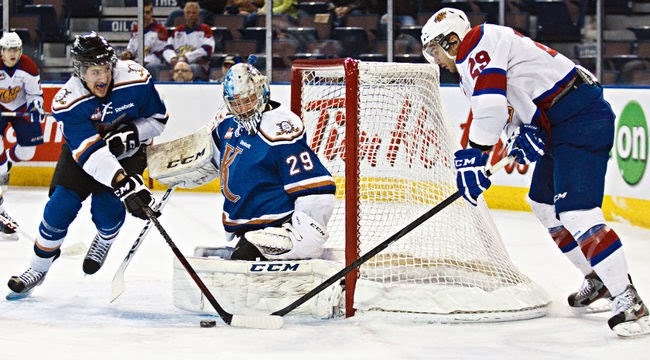 For Kootenay, a team that has hoped to make some noise in this season's WHL playoffs, a hot Skapski just could be the difference between a one round cameo and a playoff run. Skapski improves to 14-13-2-1 with a 2.94 goals against and a 0.912 ave percentage. The WHL's Eastern Conference race has gotten closer as of late and 4 of the teams with Ranger and Islander prospects on it have been battling for playoff positioning this week. Griffin Reinhart (NYI 2012 1st) and his Edmonton Oil Kings after whipping Prince George 8-0 on Friday night took the first 2 periods off and dug themselves a hole that they almost didn't did all the way out of. Trailing 6-2 after 2 periods, the Oil Kings scored 4 times in the 3rd period to tie the game and force first overtime then the shootout as the Oil Kings scored a 7-6 win via the shootout and pulled to within 2 points of conference leading Calgary. Reinhart was scoreless with a +1 with minors for roughing and hooking. Adam Tambellini (NYR 2013 3rd) scored his 2nd goal as a member of the Calgary Hitmen but it was not enough to keep the Hitmen from losing to the Medicine Hat Tigers 6-2. Tambellini is 2-4-6 in 5 games since leaving North Dakota for Calgary of the WHL. I will be conducting an interview with Adam about his leaving school for the next issue of the Blueshirt Bulletin. Meanwhile Calgary and Edmonton are fighting for the Eastern Conference lead with Calgary's lead down to 2 points with Edmonton holding a game in hand. Ryan Pulock (NYI 2013 1st) had a secondary assist on his Brandon Wheat King's 3rd goal as the Wheat Kings edged the Saskatoon Blades 4-3. Pulock's assist was his 26th and his 40th overall point as his Wheat Kings won their 3rd straight game. Brandon who took over the WHL's Central Division lead Friday night (and 2nd place in the Eastern Conference) lead the Regina Pats by 1 point and Swift Current by 2. 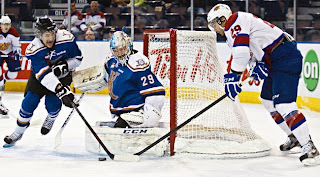 Kyle Burroughs (NYI 2013 7th) was scoreless as his Regina Pats held off the Prince Albert Raiders 4-2. The Pats used the win to move into 2nd place in the WHL's Central Division and 5th in the WHL's Eastern Conference. Jesse Graham's (NYI 2012 6th) first goal in 19 games proved to be the game winning goal as his Saginaw Spirit held off the Sudbury Wolves 4-3. The goal which was Graham's 1st as a member of the Spirit was also his 7th overall this season but also ironic as well since the last goal Graham scored was back on October against these same Sudbury Wolves but in Graham's last game as a member of the Niagara Ice Dogs. Graham is now 7-28-35 as his Spirit team now have a 6 game winning streak going. Anthony Duclair's (NYR 2013 3rd) 37th goal of the season was an empty net goal which sealed his Quebec Rempart's 5-3 win over the Rouyn-Noranda Huskies. The goal set a new career high for points with 67 (37-30-67) as the Remparts earned their 3rd straight win and pulled to within 1 point of 4th place in the QMJHL behind the Rimouski Oceanic. Loic Leduc (NYI 2012 4th) and his Rimouski Oceanic were getting their butts spanked 8-1 by the Halifax Mooseheads on Saturday. Leduc had his own issues including taking a double minor for spearing that the Mooseheads cashed in as well as going a -3 with 2 hits. Ryan Graves (NYR 2013 4th) was scoreless on 3 shots with 4 hits as his Val D'Or Foreurs defeated the Sherbrooke Phoenix 7-3. Graves who is adjusting to his new team helped keep the Phoenix scoreless on their 5 power plays. Graves is still being used as the top shutdown defender but he is very much playing on a much more talented team and is not expected to eat up a ton of minutes which is making him much more effective. Taylor Cammarata (NYI 2013 3rd) was scoreless on 5 shots as his top ranked Minnesota Golden Gophers defeated Ohio State 4-2 for the weekend sweep. Teammates Jake Bischoff (NYI 2012 7th) and Brady Skjei (NYR 2012 1st) both were scoreless with 1 shot each as Minnesota is now 17-2-3 with a 7-0-1-0 Big Ten conference mark and sits in first place by 10 points. Adam Pelech (NYI 2012 3rd) saw his 6 game scoring streak end as his Erie Otters were shut out by the Guelph Storm 1-0. Pelech was 0-14-14 during his streak and teammates just could not score on a tough Guelph defense as Guelph with the win pulled to within 1 point of the first place Otters. Troy Donnay (NYR 2013 UFA) had a rather quiet night for the Otters. Victor Crus Rydberg (NYI 2013 5th) was scoreless as his Plymouth Whalers were defeated by the Windsor Spitfires 6-2. Doyle Somerby (NYI 2012 5th) and his Boston University Terriers were defeated by 10th ranked UMass-Lowell 3-1. Somerby was scoreless as the Terriers are winless in their last 8 games. Robbie Russo (NYI 2011 4th) remains suspended for academic reasons by Notre Dame while goalies Stephon Williams (NYI 2013 4th) of Minnesota State and Eamon McAdam (NYI 2013 3rd) of Penn State were "DNP" for their respective schools.